"Beautiful, sweet, twice-roasted beets and baked goat cheese with crunchy nuts and slightly bitter greens is my idea of an easy, healthy, beautiful fall lunch! Or dinner, or breakfast, or brunch. Serve with toasted walnut bread." Spread walnuts onto a baking sheet and toast in the preheated oven until the nuts turn golden brown and become fragrant, about 45 minutes. Watch the nuts carefully because they burn quickly. Set walnuts aside to cool to room temperature. Turn oven up to 375 degrees F (190 degrees C). Crinkle up a piece of aluminum foil and place it into an oven-safe dish (such as a pie dish) to act as a disposable rack. Place beet onto foil. Bake in the preheated oven until the beet just starts to turn tender, about 45 minutes. Wrap beet in aluminum foil and let cool to room temperature. Turn oven temperature up to 400 degrees F (205 degrees C). Peel beet with a sharp paring knife; peel skin from beet. Cut beet in half and cut halves into thick half-moon-shaped slices. 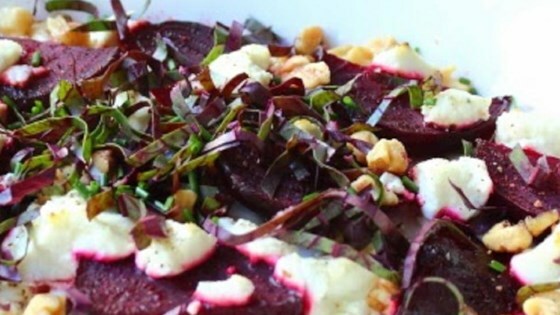 Drizzle walnut oil in a baking dish and brush oil over the bottom of the dish; arrange beet slices in the dish in a single layer. Crumble goat cheese into the empty spaces and over beets. Sprinkle with kosher salt and black pepper. Bake beet and cheese in oven until beet pieces are sizzling and the edges of the cheese are slightly browned, about 15 minutes. Cool slightly, about 10 minutes. Drizzle warm beet and cheese with vinegar and top with roasted walnuts, beet greens, and chives. Serve warm. You can roast the beet the day before, wrap it in foil, and refrigerate overnight if desired. Fantastic! Made as written, wouldn't change a thing!